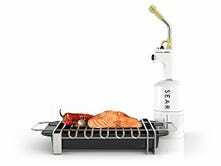 Not that sous vide cooking needed to be any cooler, but just in case, here’s the most powerful culinary blowtorch on the market. The Sansaire Searing Kit complements sous vide cooking well, in that it’s awesome, idiot proof, and makes everything delicious. The Searing Kit is extremely well made and intuitive, and even on the first try I was never concerned about burning the place down or self-immolating. If you just remembered the sub-$20 crème brûlée you used once and threw in a drawer years ago, don’t get excited, it’s not up to this task. The Searing Kit also beats the hell out of the super hot skillet option for your browning. The blowtorch isn’t the only great part of the searing kit, either. The included tray looks great, is sturdy, and goes right in the dishwasher when you’re done. We can’t tell if Sansaire’s Steak Aging Sauce actually makes for a better sear, but it certainly helps up make a damn good steak. We’re looking forward to checking out their Delta sous vide cooker as soon as we can get one on our pots.